At the Kraus Back and Neck Institute (KBNI), we believe in applying as much of a scientific approach as possible, to the art of medicine. Back pain and neck pain has plagued modern civilization for years, and ranks up there with the common flu, as the most likely cause for a patient to see his/her physician. At the Kraus Back and Neck Institute (KBNI), we believe that much back pain and neck pain can be improved or eliminated, and many incidences of back and neck pain can be prevented, by strengthening the muscles of the neck and low back. 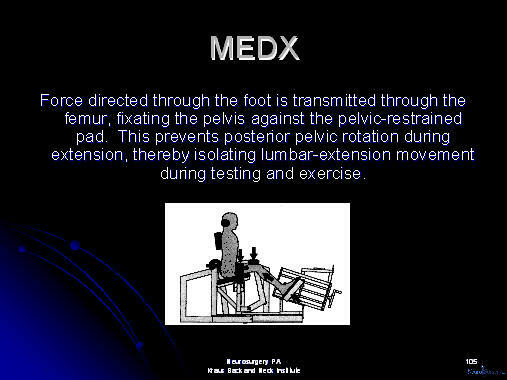 It is for this reason, that we use the highly specialized MEDX Medical Lumbar and Cervical Machines in our Institute. To the best of our knowledge, we are the only facility in Houston, TX, which has these medical grade machines. To gain a further understanding and appreciation of what these machines can do, let us look at the history of the machines, and at a history of body building and muscle building, in general. Why is this important? Because if we understand how to build and strengthen one muscle, we can strengthen other muscles. After all, a muscle, is an muscle, is a muscle. It was Arthur Jones who invented Nautilus. Before Arthur Jones, the single greatest invention in the area of body building, was the barbell and dumbbell. Now, consider a simple exercise, such as a dumbbell curl, which is intended to work and strengthen the biceps. When you really watch someone performing this exercise, you can see that the first 30 degrees of flexion are mainly a horizontal movement, not causing the raising of the weight against gravity. Yet the biceps muscle is contracting. The next 30-40 degrees of motion are mainly vertical, and the biceps muscle is working to lift the weight against gravity. The last 30 degrees of motion, is again, mainly a horizontal movement, with the biceps muscle contracting, but not doing much work against gravity. In summary, we can see that roughly 60 percent of the movement of the bicep curl is not against gravity, and although the biceps muscle is contracting, it is not being strained during this part of the biceps curl. The 30-40 degrees of motion which are against gravity (30-40 percent of the full range of motion), are the only portion of the curl, where real work and strain is being exerted by the bicep muscle. How is muscle built and strengthened? There is a common belief that going to the gym and straining the muscle, makes it stronger. This is not true. Weight lifting actually causes damage to muscle, and results in micro tears of the muscle fibers. 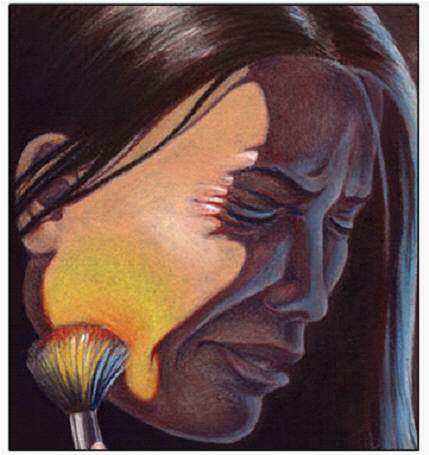 It is when these damaged muscle fibers heal, that the muscle grows stronger. Therefore, when 60 percent of the range of motion of a bicep curl is not causing muscle strain, much of this activity is wasted. True, a bicep curl will produce results, but not the best results one could expect, if they provided resistance to flexion during the entire range of motion of the muscle. In the words of a well known professional football coach I recently spoke with, he said that for his players, "I don't just want results, I want the best results they can get." Arthur Jones realized the shortcomings of exercises such as the dumbbell curl, and realized that if one could give the bicep muscle a resistance during the entire range of motion of the muscle, then one could achieve better results as far as strengthening of the muscle. Arthur Jones realized that if the resistance was provided not by lifting a weight, but by rotating a cam, that this effect could be accomplished. That is what prompted him to invent Nautilus. Nautilus was the first of these types of machines to be invented, and subsequently, a number of other companies began to develop similar types of machines. In general, a rotary type of resistance allows one to isolate a muscle group, whereas a linear movement will recruit different muscle groups. 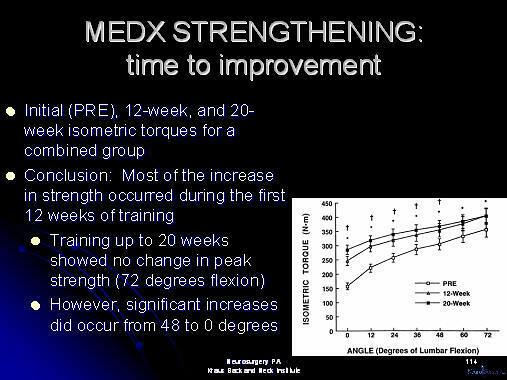 We have already looked at the rotary movement to strengthen the biceps muscle. Another example would be the pec deck, which is used to strengthen the pectoral muscles. In this exercise, the athlete or patient is sitting on a bench, with a backrest, and with the arms held out perpendicularly to the upper torso, with the elbows either flexed or straight, he/she compresses two bars or pads together, effectively providing a rotary motion about the shoulders, and isolating the pectoral muscles. On the other hand, a linear motion incorporates more than one muscle group. Let's take the bench press. In this exercise, the athlete or patient is lying on a bench. He or she has a barbell straddled across the chest (with weights on either end of the barbell), and, while gripping the bar with the elbows held at a 90 degree angle, pushes the barbell up into the air, until the elbows are straight. The barbell is then lowered, and the process repeated. The muscle groups involved in this linear motion are the pectoralis, as well as the triceps and the anterior deltoids. One might think that this is an efficient way to train, and in fact, many body builders have traditionally liked these free weight, linear, types of motions. Much of this stems from the early days of bodybuilding. Many bodybuilders will also claim that the lifting of free weights also strengthens the "stabilizer muscles," which are those other muscles which are needed to support the shoulder girdle, etc. However, let us look at the shortcomings of this method of training. When using the linear movement, let's say that the anterior deltoid muscle is the weakest muscle (compared to the pectoral and tricep muscles). Then, during a bench press, the anterior deltoid muscle will tire first, and the athlete or patient will cease being able to lift the barbell, before the triceps or pectoral muscles are worked and fatigued. Thus, the anterior deltoid muscle may receive a good workout, but the tricep and pectoral muscles will not be worked. On the other hand, an exercise to provide rotary resistance to the anterior deltoid, pectoral, and tricep muscles, individually, will allow the individual to work each of these muscles to fatigue. Thus, Nautilus, which was developed and invented by Arthur Jones, was one of the greatest inventions in the world of muscle training. Arthur Jones also proposed another novel concept, in the 1970's, which has subsequently been shown to have objective scientific data to support it. We will present this research and data further on in this discourse. Traditionally, body builders will lift weights for a certain number of repetitions per set, and perform three sets of that exercise. For example, one might perform a bicep curl of thirty pounds, eight times, and perform this set of exercises three times. Arthur Jones felt that this was counterproductive, and that in fact, one only needed to perform the exercise, with 12-15 repetitions, but to perform it to complete volitional muscular fatigue. What that means, is that one should do this particular exercise until one cannot possibly perform that exercise any more, and the muscle is completely fatigued. Then, one is done with that exercise. No more exercise of that muscle group is needed. He felt that if one could repeat exercise with another repetition, then they didn't work hard enough the first time, because if they did, they wouldn't be able to complete the exercise again. Not only shouldn't one repeat the exercise, but Arthur Jones felt that repeating the exercise will lead to overtraining, and more breakdown of muscle, than building of muscle. Arthur Jones believed that those body builders who spent 20 hours a week in the gym, would gain more muscle mass, if they reduced their workouts to possibly 5 hours a week in the gym. While it is true that the person who lifts too frequently will gain muscle, he/she may very well gain more muscle if they lift less frequently. This contradicts what one would consider to be common sense. For example, if someone is working both arms to build and strengthen the biceps muscle, what will one do if their right bicep muscle is smaller than their left bicep. The action most people would take, is to lift more frequently with the right arm, while the correct action to build the right bicep muscle may actually be to lift less frequently with the right bicep, and allow the muscle to heal between lifting sessions, and gain rest and nutrition to grow. Again, any type of exercise, even when done incorrectly, will produce results, but our goal, is to produce, the best results possible, for that individual. 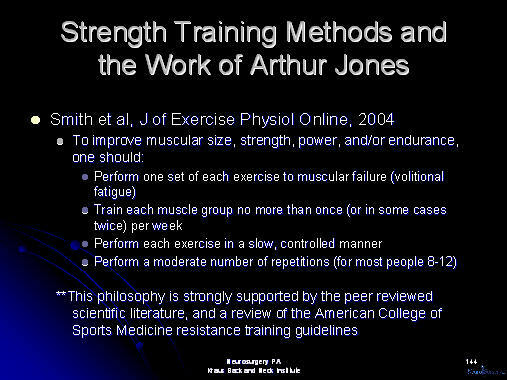 These early speculations of Arthur Jones, on the ideal way to train muscles for strengthening, were subsequently validated, when machines which allowed the accurate measurement of muscular stgrength, were developed. These Medical Grade MedX Lumbar and Cervical Machines are used at the Kraus Back and Neck Institute (KBNI), and allow us to objectively measure and evaluate muscle strength in the neck and low back, at varying degrees of flexion and extension. After successfully developing and running the Nautilus company, Arthur Jones started a company called MedX. He contributed significant money and time into researching the best ways to isolate and strengthen the lumbar and cervical spine. The machines which MedX produces, for this purpose, are the standard of the industry. The medical grade varieties of this equipment are not commonly found, but they allow the isolation, evaluation, and strengthening of the lumbar and cervical spines. Because these machines allow us to accurately and precisely measure the strength of the lumbar and cervical spines, at various degrees of flexion and extension, we can add a scientific basis to the strengthening of the spine, and can tell exactly how well out techniques of spine strengthening actually work. Most exercises which are intended to strengthen the lower back, actually strengthen the gluteal and hamstring muscles, and have much less effect upon strengthening the muscles of the lumbar spine. Resistance training using progressive degrees of resistance is effective in building muscle strength, but those muscles which we are intending to strengthen must be worked through their range of motion. The traditional exercises which are thought to strengthen the lumbar spine, include hyperextensions on the roman chair, dead lifts, and extension chairs found at most gyms. If you actually observe someone performing these exercises, one can observe that they are actually holding their lumbar spines in a locked, fixed position, and the gluteal and hamstring muscles are really doing most all of the work. To better understand this, let's look at an exercise to strengthen the arm. If we perform heavy bicep curls, the biceps will get stronger, significantly out of proportion to any gain in strength of the muscles of the forearm. Why is this? Because in a curl, the arm flexes at the elbow, causing the bicep muscle to contract and lengthen during flexion and extension, respectively. But since the wrist is locked in an isometric position, the muscles of the forearm, which control wrist flexion and extension, are stationary, and not put through a strain associated with flexion and extension. The bicep curl exercise will strengthen the biceps, but not the wrist. Similarly, traditional back strengthening exercises will strengthen the gluteal and hamstring muscles, which flex and extend during this exercise, but will not strengthen the lumbar muscles. For that, we need a machine which will lock the knees and pelvis into position, and allow only flexion and extension of the lumbar spine. 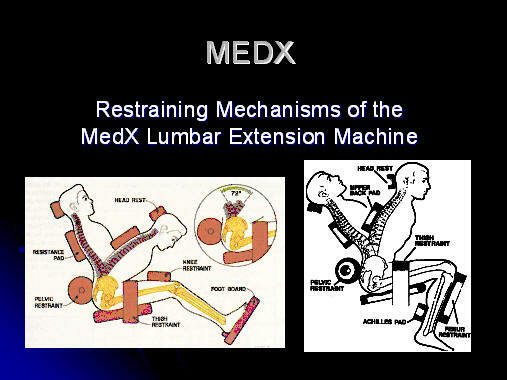 MedX for the lumbar and cervical body parts, is such a machine. 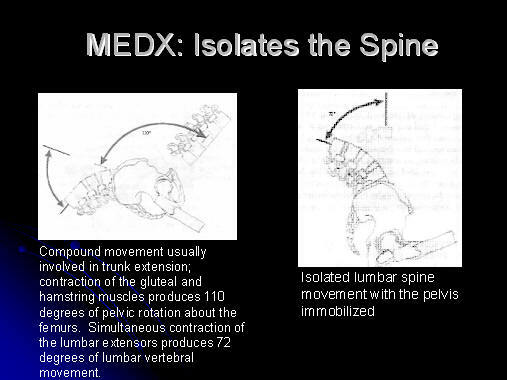 As can be seen from the images shown above, the MedX Lumbar Medical Machine allows one to isolate the lumbar spine, and exclude any efforts of the hamstring and gluteal muscles. This is accomplished through the use of knee restraints, thigh restraints, and pelvic restraints. Again, the restraints which allow the lumbar spine to be isolated, are shown. 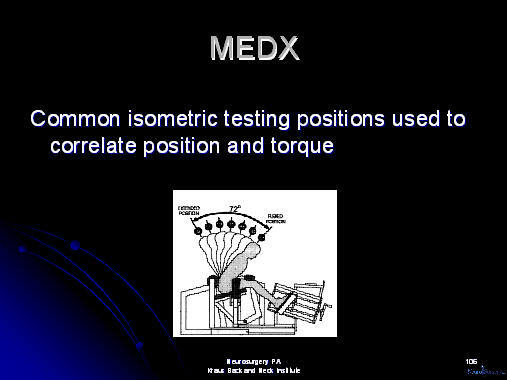 Using an isometric testing approach, since the MedX Lumbar Medical machine isolates the lumbar spine, it can be used to accurately and precisely measure the strength of the lumbar spine. 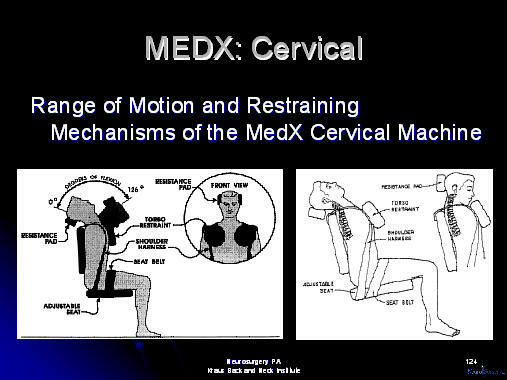 The same principle is used for the cervical spine, using the MedX Cervical Medical machine. This can be used to evaluate strength and Range of Motion, and to evaluate improvements in strength and range of motion. The MedX Medical Lumbar and Cervical machines also take into account the weight of the body itself, through the use of counterweights. For example, if one is bent over at the hips, and pushes back in an extensor type of motion, some of this effort will be used to simply lift the upper torso against gravity. If one were sitting upright, instead of being bent over, this weight of the torso would not be present against an extensor type of force. 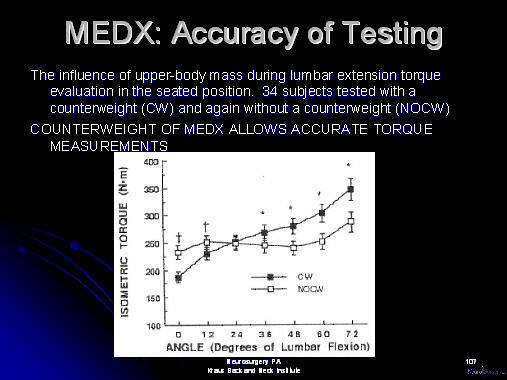 The counterweights present on the MedX Medical machines allow the accurate measurement of strength, and take the body weight out of the equation, thus allowing a very accurate measurement. 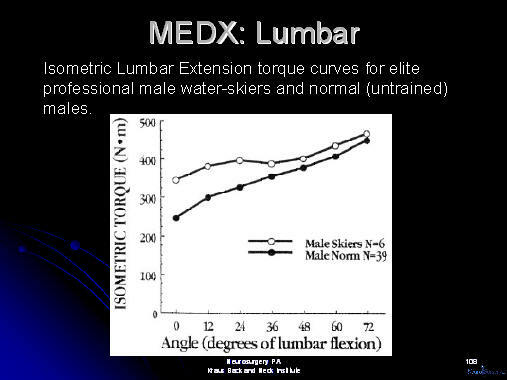 Above, we see that, as expected, male waterskiers have greater lumbar spine strength, than normal, untrained males. The x axis represents the degrees of flexion of the lumbar spine. 0 degrees of flexion is sitting upright, while 72 degrees of flexion means the subject is bent over at the hips. 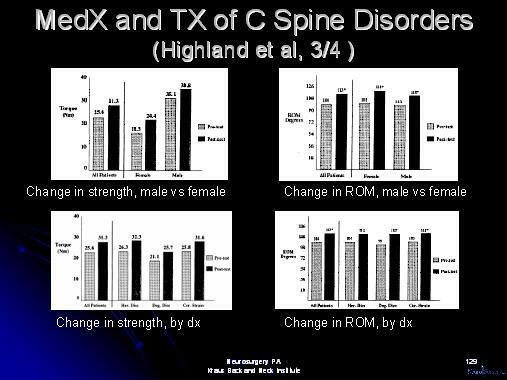 Again, as expected, males have a stronger spine, than do females. 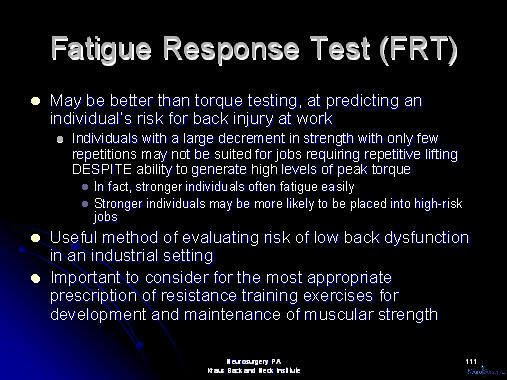 The fatigue response test (FRT) indicates how much deterioration in strength there is, after a subject performs a repetitive exercise to fatigue the back. An isometric test is done to evaluate strength, then the subject is taken through a series of exercises to cause muscle fatigue, then the isometric test is repeated, to evaluate the strength. 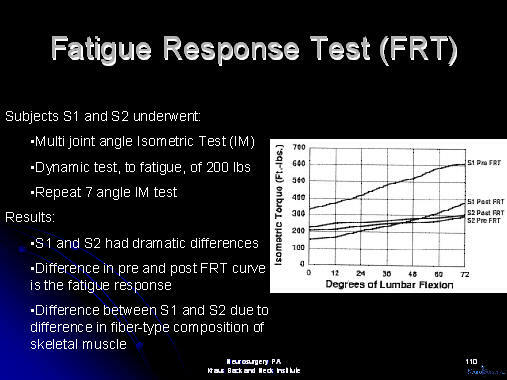 The fatigue response test may be beneficial in helping to determine which individuals may be at risk for injury on the job. Those who fatigue early on, and to a significant degree, may also weaken after repetitive strenuous tasks in the workplace. In this case, prevention of injury may involve strengthening of the lumbar spine, before a back injury occurs, in order to prevent it from occurring. It is of great interest, and somewhat surprising, that the increases in strength which occurred with training once every two weeks, were as significant as those which occurred with training three times per week, provided that the exercises in the once per two week group, were done to complete muscular fatigue. 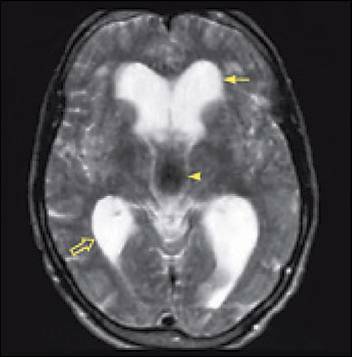 The implications of these results, on the training of the rest of the body, may be significant. 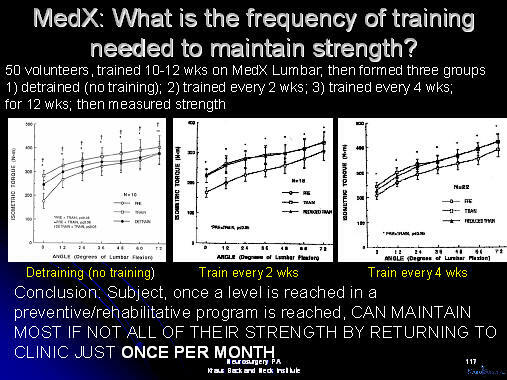 Most of the increases in strength occur within the first 12 weeks of training. One set of exercises, done to voluntary muscular failure, is all that is needed to strengthen the muscles. Additional sets of exercises are unnecessary. 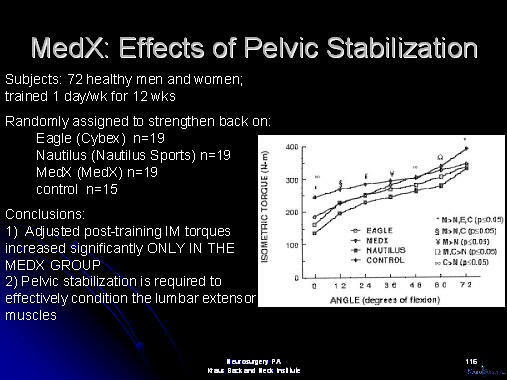 The study above examined the effects of MedX, versus Eagle (Cybex), Nautilus and controls, in strengthening the lumbar spine. 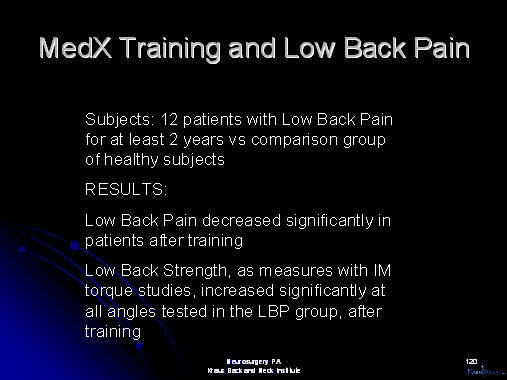 Accoring to the study, MedX was the only machine which effectively and consistent ly provided for the strengthening of the lumbar spine. Another remarkable finding is that after the desired strength of the spine is achieved, doing the strengthening exercises just one per month, is all that is needed to maintain the muscular strength. In an injured patient, or one with low back pain, the nice linear curve may not be seen, but instead, there may be a dip in the curve, indicating an area of weakness in the lumbar spine. 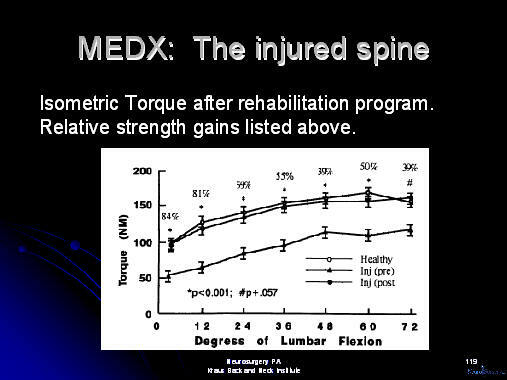 Above, we see that after the injured patient has undergone strengthening using the MedX Lumbar Medical Machine, there is a significant improvement in lumbar strength. 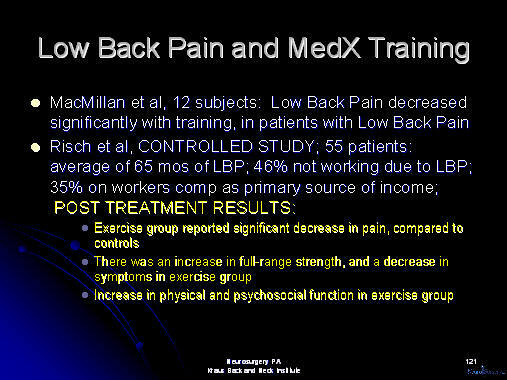 In the above study, low back pain was observed to decrease significantly in patients who had undergone back strengthening. 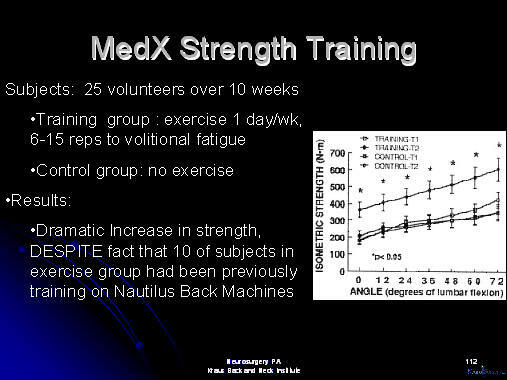 The above study by MacMillan showed that an exercise group (which had an increase in strengthreported significant decrease in pain, compared to controls. 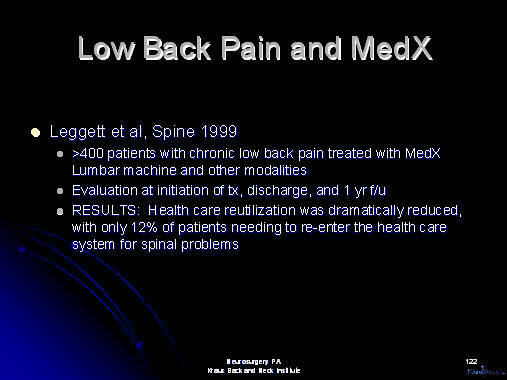 Leggett et al (Spine) showed that when over 400 patients with chronic low back pain were treated with MedX, only 12% of these patients needed to re-enter the health care system due to spinal problems. 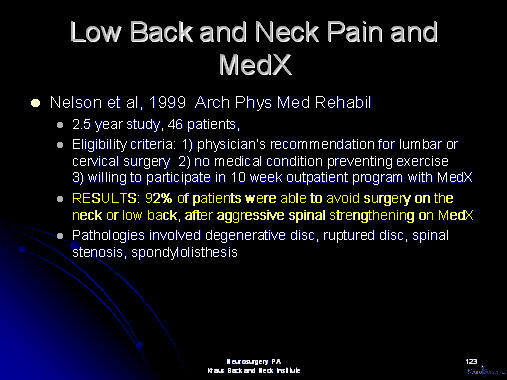 In the study by Nelson et al (Arch Phys Med Rehabil) , 92% of patients who were already recommended for surgical intervention, were able to avoid surgery on the neck or low back, after agressive spinal strengthening on MedX. 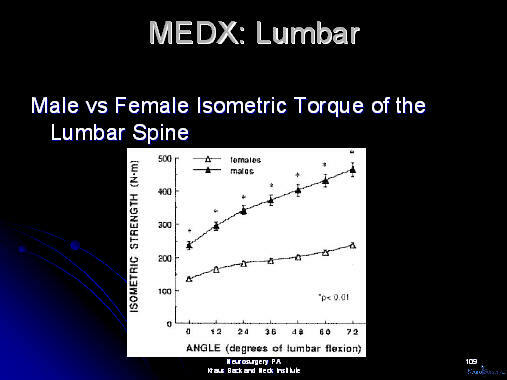 The MedX Cervical Medical Machine follows the same principle as the Lmbar Machine. By immobilizing the chest, the neck can be isolated, evaluated and strengthened. As with the lumbar machine, the cervical machine need only be utilized once per week, with the subjects exerting themselves to maximal volitional fatigue. In order to maintain strength, training once per week provides most of the benefits of training twice per week. 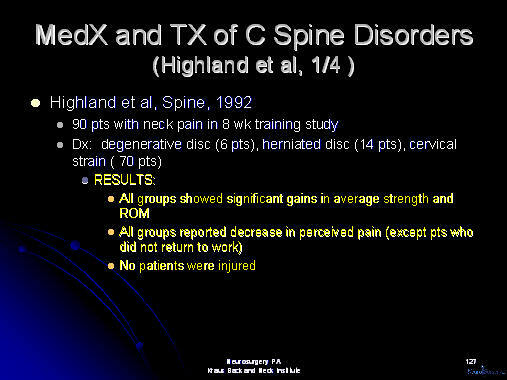 The above study Highland et al (Spine) showed that in a group of 90 patients who experienced neck pain, strengthening of the neck resulted in a decrease in neck pain. 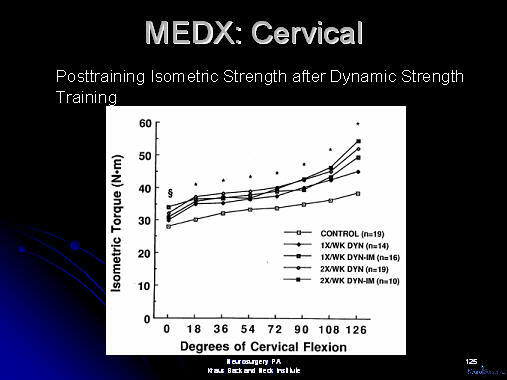 Training on the MedX cervical medical machine not only increased strength of the neck (cervical spine), but it also increased the range of motion. 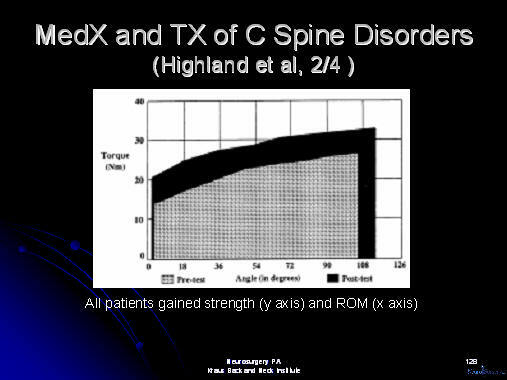 This increase in strength and range of motion held true, in both males and females, and by different diagnoses. 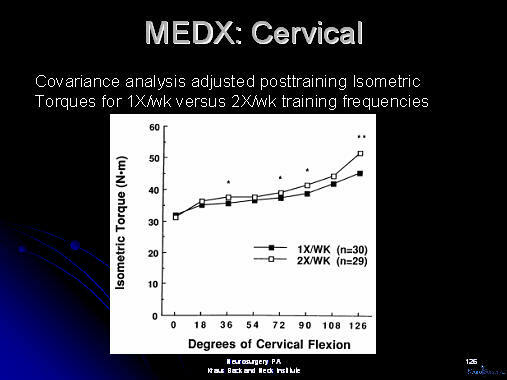 This increase in strength and increase in range of motion, in patients who underwent strengthening on the cervical medx machine, held true in patients, regardless of insurance type, and regardless of return to work dates. 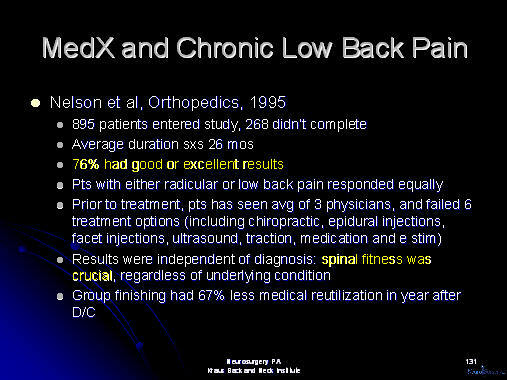 The above study by Nelson et al (Orthopedics) demonstrated, in 895 patients, that many patients with chronic low back pain experienced improvement after strengthening their lumbar spines with MedX Lumbar medical equipment. 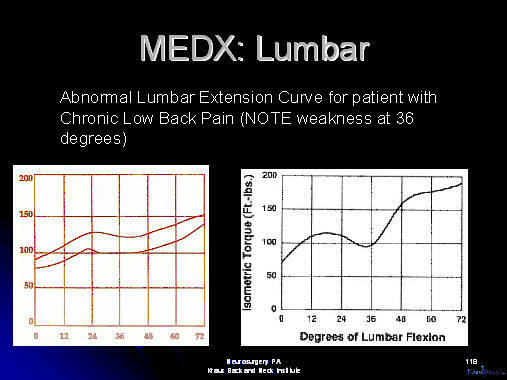 It is interesting, that prior to this MedX LOumbar Medical strengthening, these patients had seen an average of 3 physicians, and failed 6 treatment options (including chiropractic, epidural steroid injections, facet injections, ultrasound, traction, medication and electrical stimulation). 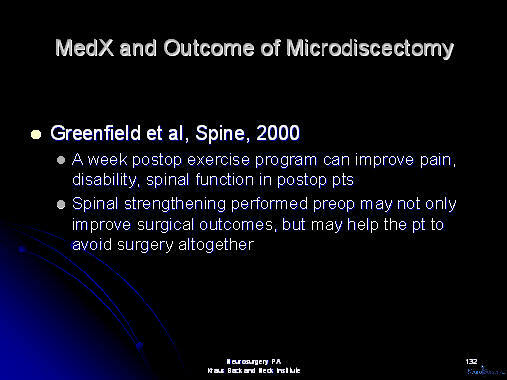 The above study by Greenfield et al (Spine) , showed that postoperative exercise may improve surgical outcomes. In addition, spinal strengthening may help the patient to avoid surgery altogether. 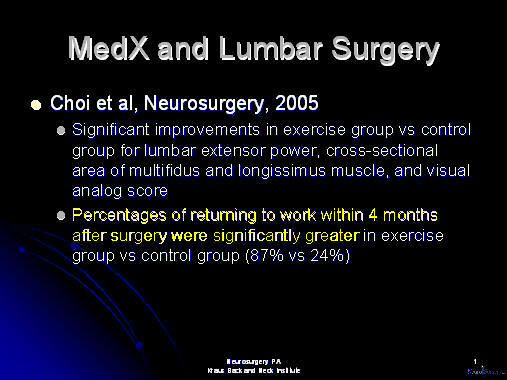 In the above study, Choi et al ( Neurosurgery) showed that the percentages of patients returning to work, within 4 months after surgery, were significantly greater in the exercise group than in a non-exercise (control) group. In the past, it was often thought that weak abdominal muscles are of primary concern in the cause or treatment of low back pain. 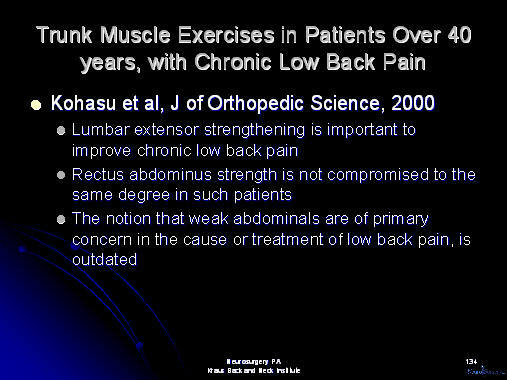 Kohasu et al (J of Orthopedic Science), have shown in the above study, that lumbar extensor muscle strengthening is important in improving chronic low back pain. 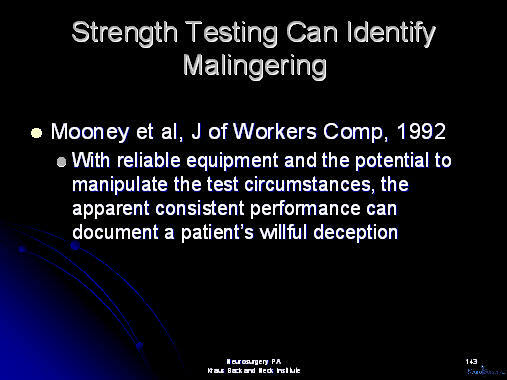 Abdominal strength is not compromised to the same degree in such patients. 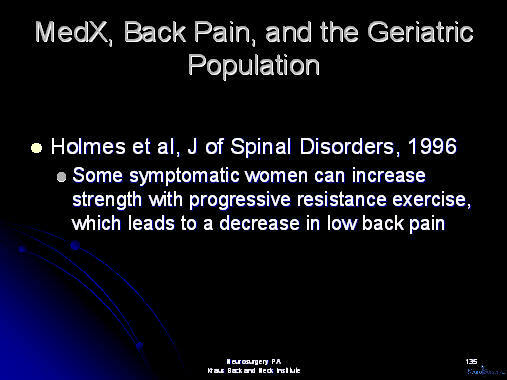 Holmes et al ( J of Spinal Disorders) have shown that women with symptomatic low back pain, can increase strength with progressive resistance exercise, leading to a decrease in low back pain. Low back pain is one of the most significant causes of days lost on the job. Each year, there are a tremendous number of workers compensation claims filed because of low back pain. 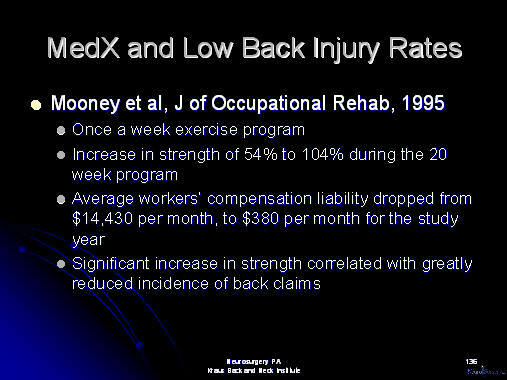 Mooney et al (J of Occupational Rehab), in the above study, found that patients with low back pain experienced an increase in strength of their low backs, of 54% to 104%, during a 20 week program. The average workers' compensation liability dropped from $14,430 per month, to $380 per month, for the study year. 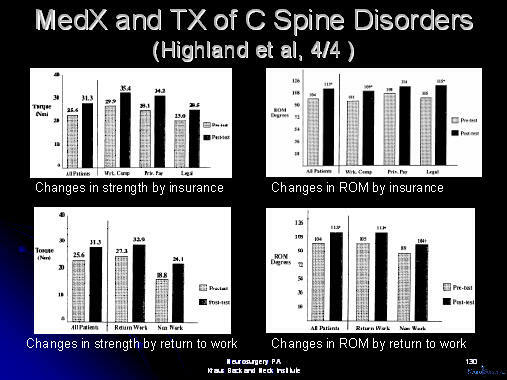 They also found, that a significant increase in low back strength correlated with greatly reduced incidence of back injury claims. 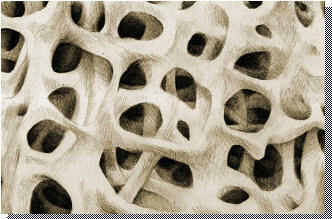 Wolff's law states that when bone is placed under stress, in grows and becomes stronger. This principle is known to surgeons who operate on bones. For example, as a neurosurgeon, when I place a graft of bone between two vertebral bodies, I rely on the stress placed upon the graft, by the compression of the two vertebral bodies, to help the bone graft to grow, and be incorporated into the fusion of one vertebral body to the adjacent one. This pressure is needed to keep bones strong. It is interesting to note, that the astronauts, after having been in the weightless environment of space, experience a loss of bone density after they return to earth. 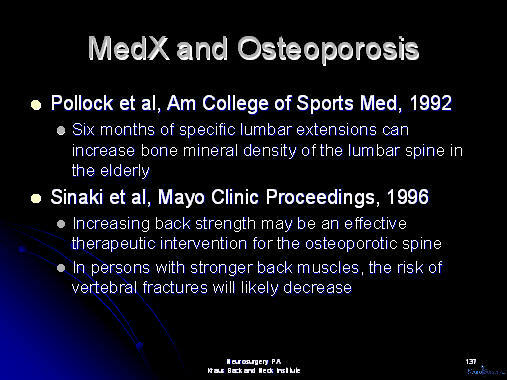 Similarly, Pollack et al (Am College of Sprots Med) , and Sinaki et al (Mayo Clinic Proceedings) , have shown in the above studies, that strengthening the lumbar spine also results in strengthening of the bone, decreasing the likelihood of osteoporotic compression fractures. Earlier in this discussion, we reviewed the advantages of the MedX Lumbar and Cervical Medical machines, in strengthening the lumbar and cervical spines. We pointed out the fact that these lumbar and cervical medical MedX machines serve to isolate the lumbar and cervical spines, but immobilizing other supporting parts of the body, thus eliminating them from the equation when it comes to strengthening. Above, Pollock et al (Am J of Sports Med), San Juan et al (J of Strength and Conditioning Res), and Graves et al (Arch Phys Med and Rehab) have shown this to be true. 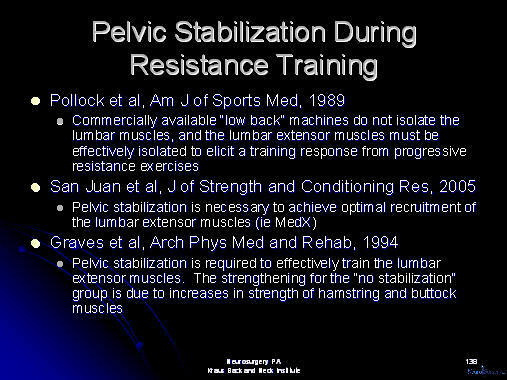 They show that pelvic stabilization is necessary to strengthen the lumbar spine. Furthermore, the "strengthening" which is apparently seen in a group which trains without pelvic stabilization, is due in large part to increases in strength of the hamstring and buttock muscles, and not due to the lumbar spine muscles. Many patients are given home exercises. 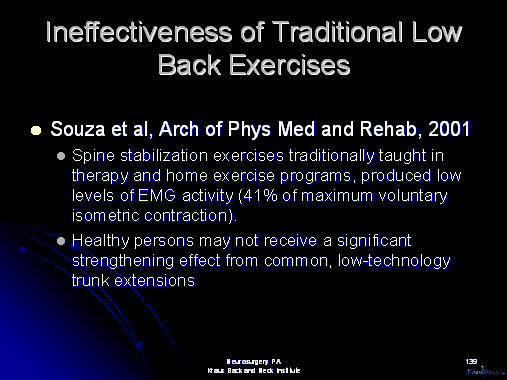 While these may help to some degree, and are better than doing nothing, Souza et al (Arch of Phys Med and Rehab) have shown that healthy persons may not receive a significant strengthening effect from common, low technoloty trunk extensions. 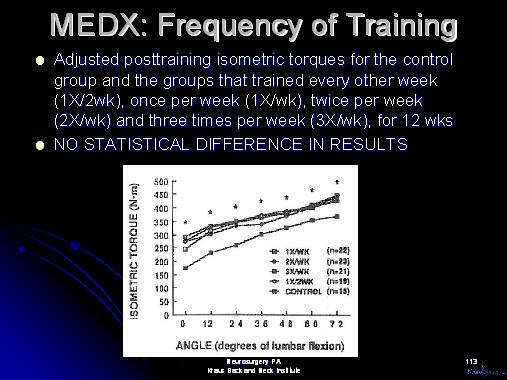 Souza showed this based on EMG (electromyographic ) activity of muscles tested during different home exercise programs. 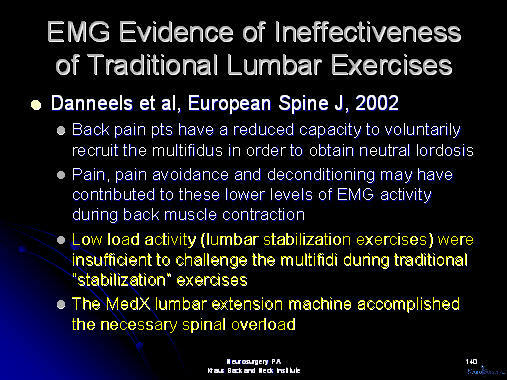 Danneels et al (European Spine J) concluded, as well, that low load activity (traditional lumbar stabilization exercises) were insufficient to challenge the multifidi (lumbar spine muscles) during "traditional" lumbar stabilization exercises. Danneels found that the MedX lumbar medical extension machine accomplished the necessary spinal overload needed to strengthen the muscle. 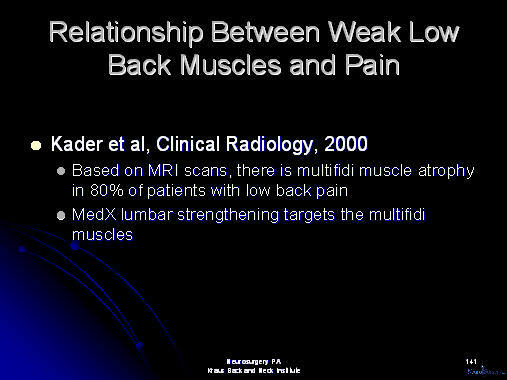 Kader et al (Clinical Radiology) found that in 80% of patients with low back pain, MRI (magnetic resonance imaging studies) demonstrate atrophy or shrinkage of the multifidi muscles (lumbar spine muscles). 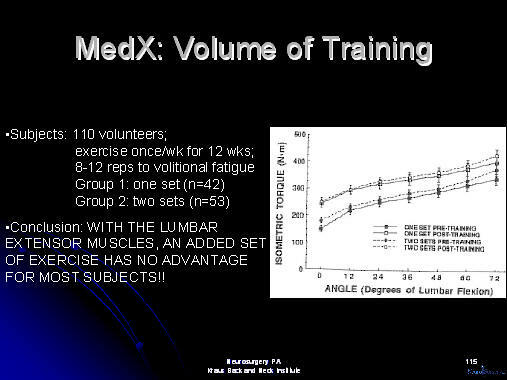 They found that MedX lumbar strengthening targets the multifidi muscles. 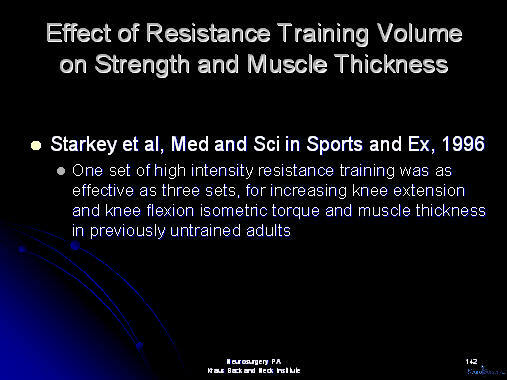 Confirming some of the above graphs, Starkey et al (Med and Sci in Sports and Ex) found that one set of high intensity resistance training was as effective as three sets, for increasing knee extension and knee flexion isometric torque and muscle thickness in previously untrained adults.